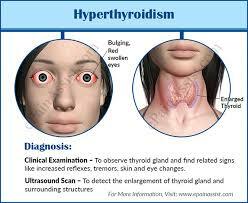 Hyperthyroidism occurs when your thyroid gland produces too much of the hormone thyroxine. Hyperthyroidism can accelerate your bodys metabolism, causing unintentional weight loss and a rapid or irregular heartbeat. Several treatments are available for hyperthyroidism. Anti-thyroid medications and radioactive iodine to slow the production of thyroid hormones. Sometimes, hyperthyroidism treatment involves surgery to remove all or part of your thyroid gland.